Sway bars are an integral part of modern suspension systems. Some people refer to them as anti-roll bars because they help reduce body roll while driving. It is essentially a bar that crosses the vehicle body, connecting the right and left side suspensions. 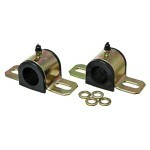 These can be mounted on either the front or rear of the car. The sway bar is connected to one axle via a bushing. 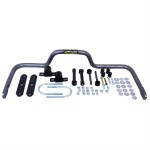 Sway bars are then connected to the chassis via a flexible joint, generally 2 flexible joints, and then connect to the axle on the opposite side of the car. The sway bar can rotate through the flexible joints that are mounted to the chassis but are hard mounted to the linkage where it is connected to the axles. The result is that if the spring is compressed and the control arm lifts on one side of the car, then the bar also forces the control arm to lift on the opposite side of the car, keeping the chassis mostly level to the road. There are quite a few benefits to the sway bar, with the primary benefit based on the fact that the sway bar keeps the vehicle level for the most part. 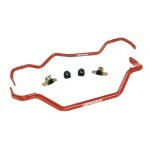 This effectively links the suspension on the 2 sides of the car. By doing this, the result is that the amount of body roll is reduced significantly, reducing the likelihood of cars rolling over. The downside to this is that if a bump is run over on one side of the car, then the bump is transferred to both sides of the car, making the drive less comfortable in these conditions. The other advantage to sway bars is that the linkage of the suspension allows for better handling and control through corners. 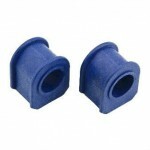 This is especially useful in racing applications where tight cornering or fast turns may be encountered. The higher the stiffness of the sway bar, the more connected the different ends of the bar are, as the result of more stiffness is that it is much more difficult for the bar to twist. This stiffness can be higher or lower based on several factors. The biggest impact is the diameter of the bar. 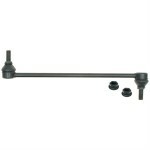 As the diameter increases, the bar becomes significantly stiffer. Other significant factors are the effective arm length, which is essentially the distance from where the bar mounts to the chassis to where the bar mounts to the axle, and last is the half length of the bar. In some performance and luxury cars, it is becoming more common to have active control of the sway bar. These systems use controllers to reduce the stiffness when driving straight and increase stiffness to reduce body tilt during cornering. 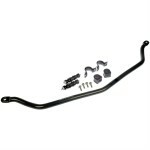 There are a number of various manufacturers that sell sway bars. 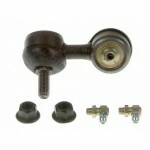 Many of these manufacturers are well known for various other suspension components. Some of the highest rated on Amazon include Dorman, Addco, Hellwig and Hotchkis. 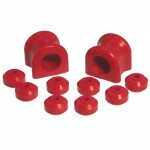 Many of the options include polyurethane bushings. One of the products from Hellwig also disclosed its materials as the bar is manufactured from high quality 4140 chrome moly spring steel. Sway bars are in integral part of many vehicle systems and a key component in reducing body roll, which as a result reduces the amount of rollover accidents. The sway bar links the suspension from each side of the car which reduces body tilt, reducing both the rollover potential as mentioned, as well as improving the handling during cornering. The downside of coupling the 2 sides of the car is that a bump felt on one side of the car will pass the energy to the other side of the car. Many automotive manufacturers are beginning to combat this inconvenience by having an active system that reduces the stiffness for bumpy roads while increasing stiffness for cornering, optimizing the combination of comfort with safe driving. What’s the Best Aluminum-Free Deodorant for Men?